Great gift for the Dinosaur lover. 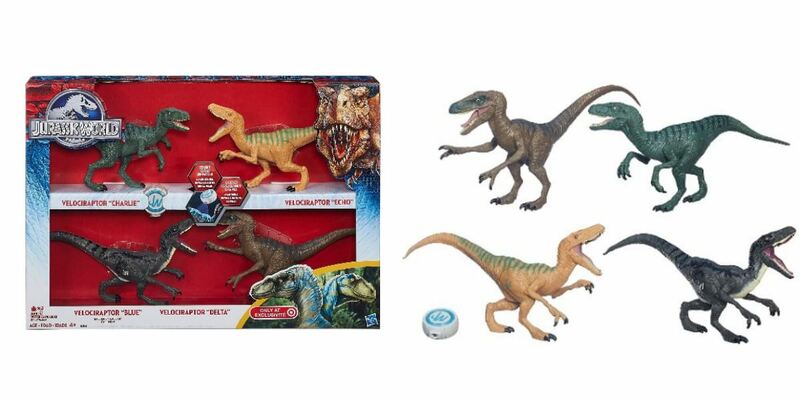 Get the Hasbro Jurassic World Velociraptor 4-Pack for $10.48 (Reg. $34.99) from Target. Don’t forget to use your REDcard for 5% off too! Your kids get 4 clever hunters to add to their collection with the Hasbro Jurassic World Velociraptor 4-Pack. This dinosaur playset includes the following velociraptors from the Jurassic World Movie: Echo, Charlie, Delta and Blue figures. The 4 of them are ready to team up to jump the fence for the hunt of a lifetime! The Velociraptor Blue figure is only available in this set. The included LED light triggers their light-morph skin, which may be the only warning tiny humans will get when these monsters are on the prowl! Ages 4 and up. Includes 3 “A76” batteries. Lands End 30% OFF Entire Order, Lunch Bags $2.79 (Reg. $15.50)!